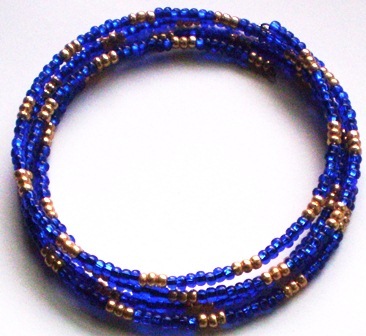 Beautiful sapphire blue and gold accent beads hand strung on memory wire reminiscent of ancient styles creates a beautiful collar fit for a Taji queen. One size fits all simply wrap around continuously. Part of the fit for Menyet Collection necklaces fit for a Goddess. Simple elegance.